This video has been ricocheting around the internet. It’s from Ottawa producer and hip-hop artist Nilton de Menezes, 21, aka NDMA (um, is that a torqued club drug reference? Nope, it’s a handle comprising his initials and the word “art” de Menezes says). NDMA came to Ottawa seven years ago. His family emigrated from Luanda, Angola, to flee corruption. He went to Canterbury High School to study visual arts, then started a university program in international relations, but dropped out to work on music full-time. He’s holding an EP release for the album called 505 tonight at the Mercury Lounge (where some of the video was shot) and will hit the Bluesfest stage July 6. 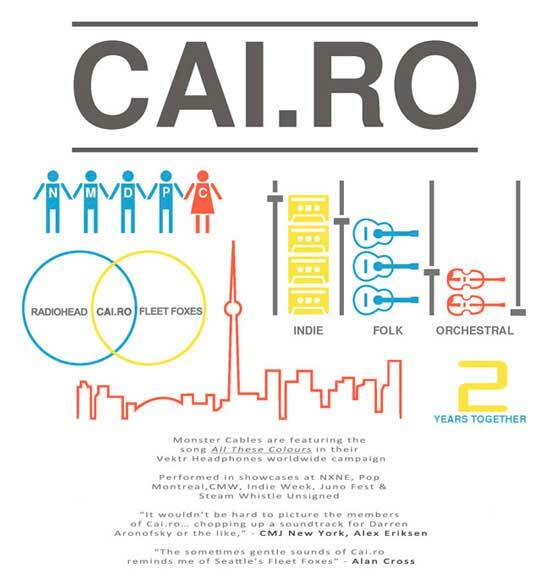 Toronto band Cai.ro are an indie rock band with an orchestral-folk bent. They’re inspired by Radiohead and Fleet Foxes, coming up somewhere in the middle of those two bands — or at least that’s how they see themselves. 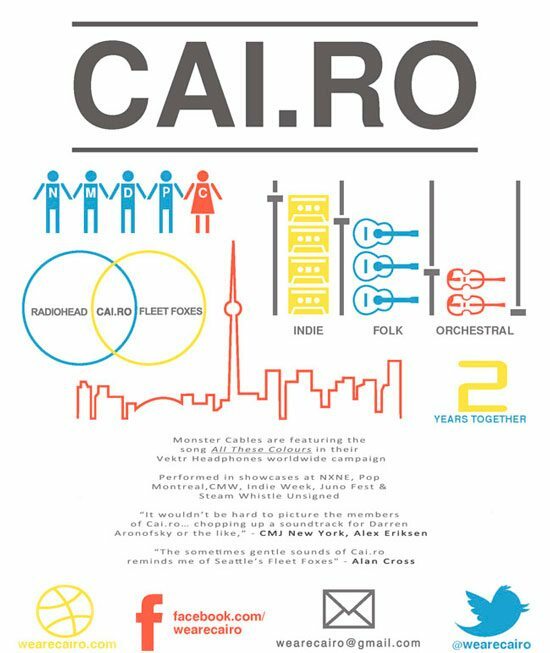 Taking a cue from publication trends and looking to shake up the traditional one-sheet bands use to market themselves, Cai.ro created this infographic (below) to describe their sound. 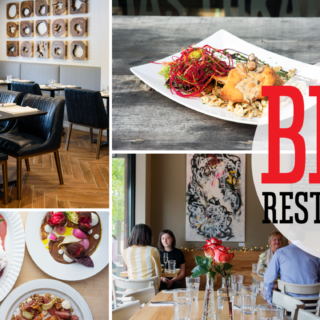 It gives you an at-a-glance view of the band, or you can head to Avant-Garde Bar Friday to hear them play with Ottawa’s Orienteers and Montreal band The Bright Road. The 4-in-1 Music Session series brings Ottawa bands to various venues for an afternoon of mostly acoustic music. This Sunday, March 10, head to Café Alternatif to hear five songwriters: two are named Alex, then there’s a Claude, an Emma, and an Amanda. Cover is a fiver with proceeds going to CHUO’s funding drive. Instrumental improvisers The Flaps play their freak-jazz jams Saturday at the Gluepot Pub. It’s a CD release for their new album called Again (Kelp Records). The band is comprised of Ottawa music scene regulars Pat Lawlor, John Higney, Martin Newman, and Jamie Gullikson. They released their self-titled debut in 2005. The Goodluck Assembly will play songs from their forthcoming, Gus Van Go-produced album Friday at Café Dekcuf. The Ottawa band took off for Brooklyn last year to record with the man who produced albums by one of their favourite bands, The Stills. Rapper The Notorious B.I.G. died on March 9, 1997. DJs Atherton, Circa, and So Nice will celebrate the 16th anniversary of his death with a DJ set of Biggie tunes and ‘90s classics at Ritual Nightclub Saturday. Members of the defunct punk band Evil Farm Children have resurfaced in The Mere Humans. They play their debut show Saturday at the Clocktower Brew Pub.